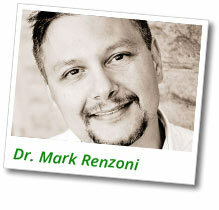 Dr. Mark Renzoni graduated from the University of Toronto in 1995 with an Honors Bachelors of Science Degree. Following University, he furthered his education at the Sutherland Chan School of Massage Therapy (1998) and the Canadian Memorial Chiropractic College (2003) where he was awarded the undergraduate admissions award. He completed an Advanced Acupuncture program in 2006 and is certified with the Acupuncture Council of Ontario. As a student, he was prominently involved in athletics, captaining his interfaculty Men's hockey team to the championship in his final year. He has been involved in minor hockey as a hockey team trainer in both the NYHL and GTHL and has an advanced understanding of injury prevention and management. Over the past years, he has gained an invaluable amount of experience and knowledge within the health care field. Working as a Registered Massage Therapist, Chiropractor and Acupuncture Provider, he has had an opportunity to work with a varied patient population. These experiences have assisted in establishing a firm understanding of the role of a health care provider in the treatment of neuromuscular conditions and overall patient interaction. As the founder of Health Matters it is his intention to provide the community of Vaughan with a competent and effective means of enhancing overall health through treatment, education and a positive therapeutic experience. 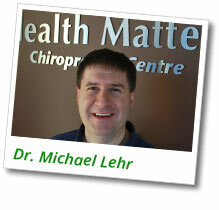 Dr. Michael Lehr has a breadth of academic and clinical experience that spans well beyond Chiropractic. Dr. Lehr has a Bachelor of Science (Hons.) from the University of Toronto. In 1999, Dr. Lehr was accepted to the Canadian Memorial Chiropractic College, an institution regarded as a worldwide leader in Chiropractic training. Dr. Lehr graduated from CMCC in 2003 with a Doctorate of Chiropractic, and the same year graduated from the Advanced Clinical Acupuncture program with the Acupuncture Council of Ontario. Dr. Lehr has over 12 years of clinical experience in physical rehabilitation and chronic pain management. He has a wealth of experience with compression garments, orthotics and orthopaedic footwear. He is also versed in the casting and manufacture of custom orthopaedic braces and custom orthopaedic footwear. He has additional training in Kinesiotaping, Acupuncture, Electro-Acupuncture and Therapeutic Laser, as well as being a Certified Decompression Traction Therapist. Dr. Lehr has a special interest in chronic pain management and currently splits his practice between the multi-disciplinary pain management team Allevio Pain Management, and our team at Health Matters Chiropractic Centre. 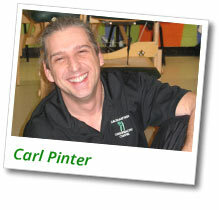 Carl Pinter, RMT, joined our clinic in 2007. Carl graduated from the accredited school of Sutherland-Chan and has worked in a clinical setting since 1998. Carl also holds an Honours Degree from the University of Toronto in Physiology. We feel fortunate to have his services available to our patients Mondays, Fridays and Saturdays. Carl specializes in deep tissue massage and trigger point work. Pressure is not a problem for Carl but do not worry, if your needs require soothing relaxation work with a lighter touch, Carl can accommodate. 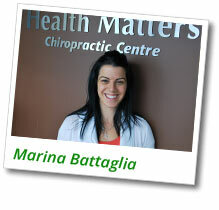 Marina Battaglia, RMT, graduated from the Massage Therapy Program at Centennial College. She has been practicing since 2007 and is an active member of the College of Massage Therapists of Ontario and the Registered Massage Therapy Association of Ontario. She has experience with pre and post natal and infant massage as well as working with various physical disabilities and diseases like cancer through various programs in Toronto hospitals. In addition to Swedish Massage, Marina incorporates numerous advanced techniques adding versatility to her individually tailored treatment plans. Her skillful and therapeutic hands deliver treatments enhanced with such techniques as trigger point and pressure point release, soft tissue release, PNF, manual lymph drainage, deep tissue and fascial work. All of these special techniques will allow Marina to help you reach your health care goals. In previous years, Marina has taught massage therapy students at the Canadian College of Massage and Hydrotherapy and as a result she enjoys educating and sharing her knowledge with her clients. Marina has been a member of the Health Matters Team since 2010 and is available from Tuesday through Saturday. We invite you to stop by and say hello, or call to book an appointment today.